Okay, I've been tagged enough times to get on the ball and do this. Don't ask me why I decided to do this today. I'm supposed to be packing for the move. Hum..procrastination maybe? 7. Bring someone to Christ--Love that one Theresa! 7. Decorate--Although I love to try. 6. His leadership abilities--at home and work. 7. And, of course, he's a total Hottie! 1. "That is NOT okay with me." --usually to Reia about some behavior. 2. "Do everything without arguing or complaining." --We've been working on this verse for a while. 3. "I know I've been on the phone for a while. Mommy promises she'll be off in just a minute." 4. "Am I talking on the phone? Please don't interrupt." Actually, #3 usually follows #4. 5. "Did you wash your hands? Let me smell to make sure." 6. "Can you ask me nicely?" 7. "We don't have to stop and eat at McDonald's just because we see it." 5. Anything by Shel Silverstein or Sandra Boynton--Yeah, yeah, I know. But I read A LOT of kids books. 1. The Princess Bride--"Marrwaige, marrwaige is what bwings us togever today..."
I know there are thousands of fab movies out there, but I am not a big movie person. 3. Orange Hazel--You know who you are. Now, start a blog already! 4. Cora--This could be your first post! Hint Hint. 6. Terry--Don't really expect #5 or #6 to participate. But you're tagged anyway. WooHoo! I actually remember something my teachers taught me. I'm feeling better about homeschooling my kids through the third grade now. Ha Ha! P.S. For those of you who don't know, that is me with her in the pic. While laughing hysterically at Tom and Jerry cartoons. "Mom, you can watch this because you're old. Like 13 or something." By the way, if you haven't introduced your kids to cartoons from our generation--they crack up. Which will, in turn, crack you up! Too fun. It's Beginning to Feel A lot Like...Spring? Every year about this time I decide I am sick of the cold weather and ready for spring. Unfortunately, I usually have about 90 more days of wet and cold weather. But, this winter seems to be different. I just heard the weather man on channel 5 say it looks like the WHOLE winter will be very mild if not unusually warm. (I do realize the weather people aren't always reliable.) Personally, I'm thrilled. I love it cold from October to December...then I'm over it. I plan on getting back into my running game early this year and getting into shape before June. So, how do you feel about the warm winter? That is, if it is warm where you are! 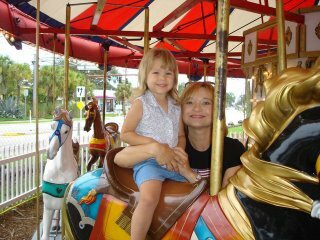 I came across this picture of Reia and me August 2004 in Florida. Do you ever look at pics of your kids and think, "My how they have changed in such a short period of time."? I was pregnant with Reese then and our time with just the two of us was getting short. 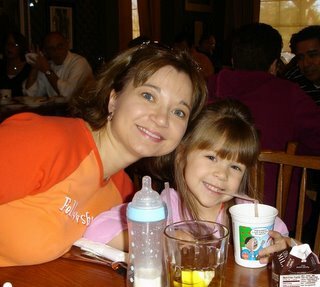 I'm so glad we take pictures to remember these precious moments! 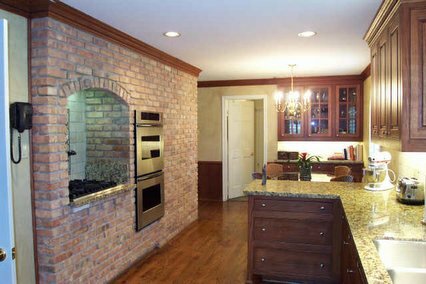 Anyway, here's a pic of the kitchen. I am not crazy about the color of the brick wall, but thrilled about finally having a double oven. The current owners did a great job on the remodel. I have read several posts over the past year regarding some people's complete and utter loathing for Wal-mart. Personally, I like Wal-mart. And, if you are like me, and do 99% of the grocery shopping in your family, you find what ever ways possible to save money in this area. It seems to me there are several methods for saving money on groceries. First, is the coupon method. That means I have to get the Sunday paper every week, sit down and pour over all the coupons; decide which ones I will use now or later; clip them; save them; and go through the whole lot each time I make my gocery list. It wears me out just thinking about it. You can just use them regularly or wait until your store of choice has double or triple coupons. I have saved a ton doing this in the past. But, I'm not sure we even ate all of the groceries. Some days it was about the great deal I got. Secondly, you can just base your menu for that week on what is on sale. I was never good at this. I have a rhythm with my menu planning. The meals have to go in a certain order, and we rarely have a dish twice a month. (With a few exceptions.) Again, this just doesn't work for me. Not to mention the fact, that to get the great deal, you have to have one of their stupid cards. Which brings me to 2A. I DISPISE the frequent shopper card. "I'm sorry, we are in the process of moving. I can't locate my card." "Oh, that's terrible! Let me just have your phone number." "Nope, not under that one. "Don't you just have an emergency card you can swipe? I really don't want to pay an extra twelve dollars for my goceries today because you don't have my blood type on file." "Sorry, we're not allowed to do that anymore." Did I mention I DISPISE those stupid cards? The third method is buying in bulk. I don't recommend this unless you have a large family and even larger freezer and extra fridge. I save so much money at Costco and Sam's I'm broke by the end of the trip. I do love those stores though! The last method, and the best in my opinion, is shop at Wal-mart supercenter. No cards, low prices on almost everything and no cards. You can even use the coupon if that works for you and save a little more. But, the nice thing is that I don't have to. I can go in, pick up all my groceries, a pair of socks at a reasonable price, and not blow my whole grocery budget. I went to Tom Thumb this morning. I love Tom Thumb for the clean store, nicely kept shelves and fabulous customer service. Everyone today was so nice. Helped me when my bag of frozen veggies popped open and even loaded my goceries into the car. I really contemplated whether or not I would make the switch---until I remembered every item was about .20-.30 more--even if it was on sale. We finally had Reese's First Birthday Party the Saturday after Thanksgiving. 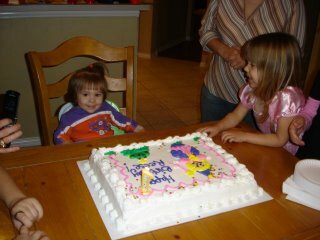 She had a great time eating the cake and playing with her cousins. Well, we have made the move to my parents house for the next three weeks. I have heard that you can never go home again, but I'm here to tell you that you can and I have. For the next three weeks anyway. My mom is a great cook, but I am trying to be a help and not a hindrance, so I have offered to cook dinners while we are here if she will handle the Christmas day food and festivities. I think I am getting the better deal on that one. All of this makes me feel like a grown up. When I was a teenager--a quite selfish one at that--after my mom had made this fabulous spread, I would go take a nap. I didn't mind helping at all. But sleep has always been more important to me and I could clean later. By the time I got up from my food coma nap, the work was all done. Sorry about that mom. Now that I have to do all of the work, I realize what a pain in the rump I was! Anyway, I'm looking forward to the holidays at the parents. I bet we have some great memories this year! Okay, after packing up most of the "little things" in our house, I have concluded we have too much stuff. I am a kitchen gadget junkie. We packed quite a bit of it in the initial packing stage, and I pulled the rest of it out today so I could wipe down the cabinets and drawers. And, I really can't believe how much stuff I have. I have an apple peeler/corer/ slicer. I also have an apple/corer/slicer that is smaller for single apple jobs. I have about 30 pampered chef stones. I use about 3 all the time; 7 others once or twice a month and the others hardly ever. What else--2 pizza cutters, several ice cream dippers, several sets of knives, and a bazillion other little things. (Love the word bazillion, don't ya?!) I haven't even mentioned the amount I have already given away or thrown away. A set of dishes, glasses, wok, bread machine, 2 mixers, another set of knives....etc. I know I am blessed. A blessed pack rat at that. I keep thinking about all fo the people who have nothing. I want to take Reia and show her how little they have and how we should be on our knees in gratitude every day for all that God allows us to have. We can do with so much less, and aren't made to. So there you have it. My observation for the day. Packing is a totaly pain in the rump. Kinda wish I had less stuff; but because of God's generosity on our family and that I rarely throw anything away, that may never happen. P.S. I'm not asking for God to take away all of my worldly possessions, by the way. Well, my house looks like the Grinch as been here and taken it all. Instead of Christmas decorations and lights, we have bare walls and boxes. I am looking forward to going to my mom's house for three weeks and enjoying some of the "holiday-ness"(yeah, I know, not a word) that feels missing right now. Hope everyone is enjoying the Christmas season! I will be more so in one week.